Intercambio was born in 2000 from a desire to help immigrants in Boulder County improve their quality of life. Founders, Lee Shainis and Shawn Camden, initially addressed this need by providing English classes that would help bridge the gap between immigrants and non-immigrants. In the beginning, the English classes took place in Lee’s basement. We soon learned that the language was not the only barrier — immigrants expressed feelings of deep loneliness and alienation. In order to help with the difficult cultural transition, they hosted events and gatherings to build a sense of community, and to give back to Boulder County. Over the past decade, Intercambio has affected many community members across Boulder County, while serving as a model for other ESL nonprofit organizations across the country. Intercambio serves adult immigrant students ages 17-80, who come from 45 different countries. The majority of our students qualify as “very low income” and about 50% of our students have lived in the U.S. for four years or less. 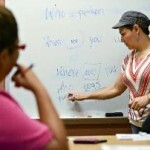 To date, Intercambio has helped 8,000 immigrants and trained 4,000 volunteer English teachers. Additionally, Intercambio led 35 interactive “Living in the U.S.” workshops for 400 immigrants, and coordinated citizenship classes that helped 33 students receive their citizenship in 2011 alone. Intercambio has distributed over 50,000 copies of The Immigrant Guide: What Every Immigrant Needs to Know to 400 agencies in 45 states. Intercambio also produces its own 6-level English language curriculum, which guides volunteer English teachers through 12 interactive, life skills-based English books. Each year, Intercambio celebrates its cause with its fundraiser, La Fiesta, which has drawn over 1,300 community members annually since 2001. All of our success is because of our generous donors like you. Every donation makes a difference in fulfilling our mission to build understanding, respect and friendship across cultures through educational and intercultural opportunities.